Remember the old movie “Honey, I Shrunk the Kids”? Sometimes I think I am living in it! Everything in my world is too large for me now. Cups of coffee are too heavy to lift; dishes are too heavy to wash; pulling on a gas pump feels like wrestling a python. How would I ever do big tasks with rheumatoid arthritis hindering me? No, I can no longer lift 50lb. bags of concrete. No, I cannot move a ton of fill dirt with a wheelbarrow. And, NO, I will not be planting trees or trimming them 15 feet above my head. After yesterday’s post about the me before RA, I thought we could all use a little encouragement as to how to approach those “larger than life” sized tasks with our new “reduced” abilities. 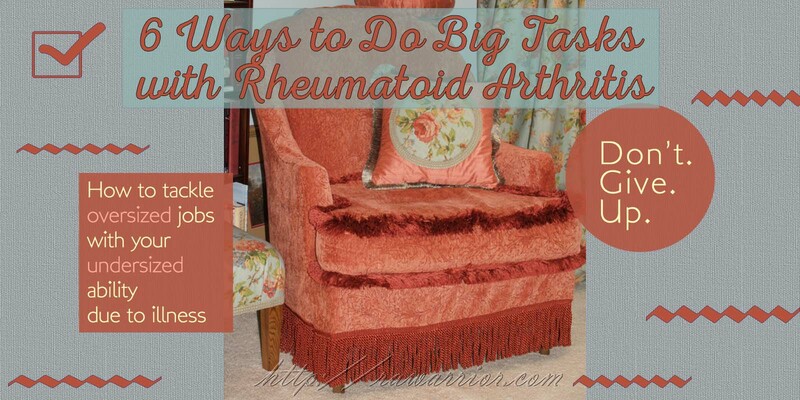 For the things we still keep on our lists, here are my suggestions for doing big tasks with rheumatoid arthritis tagging along. How can you do big jobs with undersized ability from RA disability? 1) Plan. Plan out the details and study the process to mentally prepare. Get an accurate view of what steps you will need to take. 2) Find different tools. Take time to gather tools which will be more appropriate for you: smaller, lighter weight, and higher quality like this Softtough pruning snip. Examples include child-sized garden tools, smaller sized professional paint brushes, and soft rubber mats to kneel on. 3) Ready, set, wait. Gather all of your supplies and wait for a good time. That might mean a good shoulder day or a good hand day. It might mean a week with no doctor’s appointments. If you plan ahead, when a good moment comes, you will be able to seize it. 6) Do something else. No, I don’t mean give up! But think outside the box. 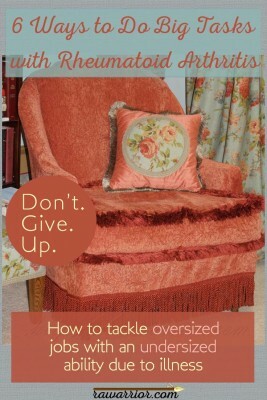 When I bought a $10 chair at the Salvation Army, I thought I would just re-upholster it as always. What was I thinking? I don’t have the strength to pull and staple! After I thought about it a while (only one year! ), I realized I might be able to sew a sloppy slipcover instead. Maybe you can think of something different which will be just as good, but more feasible for you to undertake. By the way, I used every step on this list to accomplish my chair. What big tasks with rheumatoid arthritis are in your future? So, what is on your list? Is it making jelly or homemade pizza? Writing a blog? Planting flowers? Taking a road trip? Sewing a baby quilt? Teaching a class? Building a snowman? (Still on mine!) Don’t just do something; sit there. Sit, but scheme. Amazing isn't it….how the new person still thinks they should be able to do what the old person used to do. I still catch myself doing some of those things….but pay for it later. I have taken on the approach like you mentioned….do the task for 15 minutes, rest, then go back again. It may take longer but it will get done…..eventually, right? I love that saying! And I completely agree. I've found that taking the time to really think ahead and plan things has helped me do way more than I thought I could. I took one of the most ambitious trips of my life last summer, marking one year of RA, and am taking another one this September, so it can be done! Hold on as long as you can, Jenny. 😀 We are all different, so do not give up. I just love you! You are such an inspiration. I am struggling with the "I can't do what I want/use to do" syndrome pretty bad right now. Thank you so much for sharing your struggles and triumphs. Very positive, helpful blog post. We all need more of this type. I have changed so many, many things through the years. Recently I got tired of my old corelle-ware dishes, which are lightweight, got a new set of real dishes. Can’t hold them, but it is fun and rewarding to have the pretty ones. One can’t give up on life because it’s too precious. A dear friend was a polio survivor, very handicapped. I used to marvel at the way she got things done. That was years ago, now ever so often I remember how Mary did something and use the same method. Thanks for the reminders of how to do things in managable ways. My husband and I were just discussing last night how long it’s been that our place has had a thorough-going over. (not spring cleaning-I’d say it’s been years since some of our curtains have been washed.) I used to be a type-A person-get it all done at once. That changed A LONG time ago!My hubby talked about having someone come in to do it but I have to adjust to that idea. He’s great about doing the daily type housework but it’s not fair to him that he should have to do everything with working a 50+ work week too. I try to follow the above guidelines when I do attempt some housework or like task;and appreciate all the ideas to improve on my imperfect system. I was renovating the basement Sept. 2008 when I became sick with RA. The painting is still undone and I still dream about finishing it. I finally had the nerve to put away my tools and painting supplies last month and admit that i wasn’t going to be finishing anytime soon. I kept hoping that this wasn’t real and the real me was coming back, the one who thrived on DIY projects. I now realize I was in denial this first year and am moving into acceptance and developing coping skills. Thanks Kelly, your 15 min. painting story made me laugh and the article gave me inspiration and hope to find new ways to get the hard things done. This reminds me of a personal funny moment, under the heading of “compensate,compensate.” My newly-divorced friend was renting a room from me when my sweetheart died suddenly. We looked at each other and one said “How are we going to get our cars fixed now?” The other said “Well, we have to 1-learn to do it ourselves, or 2-earn enough money to pay someone, or 3-sleep with a mechanic!” It gave us comic relief at a time we badly needed it. Great post as always Kelly. I used to be a ‘clean the whole house in one day’ kinda gal, & strange but true, I miss it!!! This summer holiday I have plans to do the whole house, but in manageable chunks and while enlisting the kids help to do the bits I can’t. Things like cleaning paintwork will finish me, but I can still sort and throw stuff out, tidy and organise while the kids get extra pocket money for doing the paintwork. Last week my hips had me scuppered but come tomorrow I plan to get started!! Good luck with the house, Gilly! “Scuppered”? Hahaha. One of my big projects is to take some cooking classes. I love to cook and want to learn new skills. Half of the battle is already won because my co-workers gave me a gift certificate to the cooking school I want to taking classes at as part of my retirement gift (had to take a disability retirement effective August 2010). I keep looking at the catalog, reviewing which class I think I can complete, and waiting for the opportunity. I already know that I need take a 3-day class instead of 1-day class, this way the class is of shorter duration each day instead of a marathon. I also know that I will need to prepare dinner for the 3 days in advance so that my son will have some food in case my shoulders, wrists & fingers are too swollen & sore to cook after I get home. I continue to plan & keep my eye on the prize. I’m new to this RA lifestyle that my body is forcing me to adapt to. I’ve always been one to tackle any project and complete it in record time. Now I’m learning to do things like have my husband open jars slightly for me on days that I know I will need relish, jam, etc…Today I convinced myself that the wadded, somewhat rolled clean sheets fit in the closet almost as well as last years neatly folded ones. Short spikey haircuts work well, those slide on Sketcher shoes aren’t that ugly. Those pots can stay on the stove, they are clean. If I can’t get the vaccuum out today, maybe tomorrow. I hate asking for help with the simplist tasks, I feel embarrassed, and so useless. Tell me it gets better. I seem to be stuck in this forever flare. I have tried to do things this way for the last 17 years. I have actually taken 3 weeks to paint a small room! Sometimes I am a little impatient and I end up paying for it. A few weeks ago I wanted to wash the bedskirt. I thought I could just pull it little by little and lift the mattress with my knee. Unfortunately, I was wrong and I injured some lower back muscles. The pain was extreme! I am slowly recovering from that injury and I have decided I don’t need a bedskirt! I love reading all your posts. I wish you had been around when I was first diagnosed (I don’t know your age but I’m sure you are at least 20 years younger than me). 17 years ago I had to figure everything out for myself at the age of 36. I have experienced a lot of what you write about. It makes me smile to read your posts! I would like to wall paper my half bathroom. Before RA I could paint. Room clean the house & make a great dinner in the same day. Now I’m challenged to keep up with basic things. Me too Val. I have a hard time with any scrubbing especially – even dishes most days. Recently I repaired a toy for Roo and it was SO hard to do but it felt so good to do it. It’s so funny at first I thought you said wallpaper half my bathroom. LOL. What is so frustrating to me is not having the strength in my hands. Constantly dropping and breaking things. But, I will continue to try….will not give up. Sitting here taking a break taking down Christmas decorations on my day off. My way of dealing with this… Give up on the tasks that do not give you pleasure. I’ve hired a cleaning women, can only afford once a month. So I keep my bathroom clean, stay out of my husbands and ignore the dust. I still go to the gym, but now I swim. Afterwards I enjoy the hottub, sauna, and steam room. My daughter says, Are you trying to melt away the fat? That works. One of my most enjoyable hobbies has always been refurbishing furniture. Shrug, now I do the planning. Allow my husband the enjoyable task of sanding (Har har) and I do the finish work. I travel but I allow others to be THE driver, I get to ride shotgun! And when I’m too exhausted to do the dishes after I cook… we’ll it’s okay if somebody else would like to do that. (Paper plates anyone) It’s all about trade offs, and leading the life you have the best way you are able. By the way, when my thumbs don’t work I don’t sweat the typos! 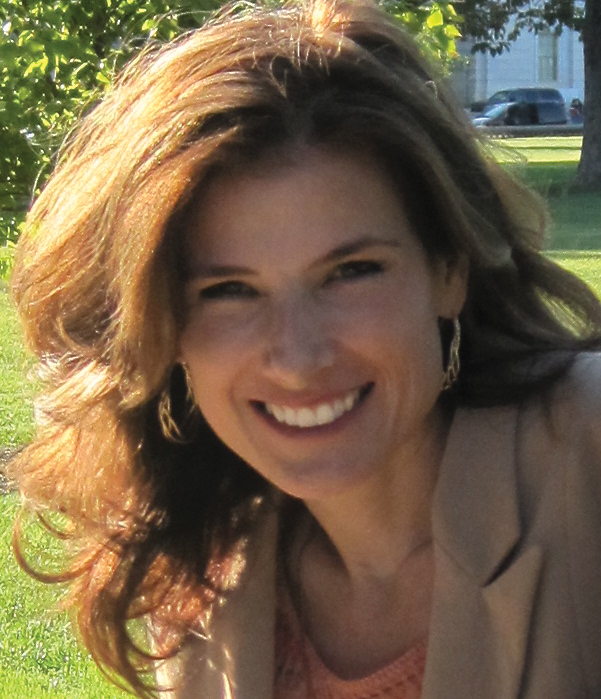 Thank you Kelly – this information is so encouraging to me. Everything takes me twice as long anymore. I love your strategies – it makes me feel understood to see that others understand the way that its impossible to do things the way you used too. This is totaly how I’ve conducted my life for years now, even long before the diagnosis. I’ve got some pretty big jobs done this way, building chicken coops and enclosures, making fences, painting rooms. It does take longer .. The chicken coop could have been done in a weekend by a “normal” person, it took me months, but I did it, it’s it’s how I want too which is the crucial thing!